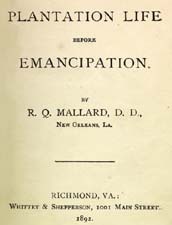 R. Q. Mallard (Robert Q. ), 1830-1904 Plantation Life before Emancipation. Richmond, Va.: Whittet & Shepperson, 1892. African Americans -- Missions -- Georgia -- Liberty County. African Americans -- Missions -- Southern States. African Americans -- Southern States -- Religion -- History -- 19th century. Plantation life -- Georgia -- Liberty County -- History -- 19th century. Presbyterian Church -- Clergy -- Biography. Presbyterian Church -- Clergy -- Southern States -- Religion -- History -- 19th century. Presbyterian Church -- Missions -- Southern States. Presbyterian Church -- Southern States -- Religion -- History -- 19th century. Presbyterian Church in the Confederate States of America. General Assembly. Slavery and the church -- Presbyterian Church. Slavery and the church -- Southern States -- History -- 19th century. Slaves -- Southern States -- Religion.